It's tough to follow up a book like Peace Like a River, but for an avid reader such as myself, it had to be done. I like to have both a fiction and non-fiction book going at all times. As for fiction, I pulled Christ the Lord: the Road to Cana off the shelf a few days ago, and since then, it's been very hard to put it down. Selecting that book was not a hard choice. For one thing, I loved Christ the Lord: Out of Egypt. Both of Anne Rice's Christ the Lord books are pretty astounding. She honors Scripture within fiction, writes beautifully, and presents history accurately. As for how she describes Jesus - brilliant. Perhaps it seems controversial, but who hasn't sat around, imagining what Jesus was like - as a child, growing up, obeying Joseph & Mary, working as a carpenter, and all the while never sinning? We have a great account of Jesus in the Bible, of course, but I don't see any harm in using our God-given imaginations, as long as Scripture is not contradicted. The Road to Cana was also an easy choice because my husband "oooh"-ed and "ah"-ed out loud when he read it last month. We usually read together in the living room at night. I sit in my spot on the couch sipping tea, and Johnny sits in a chair across the room sipping a martini (or Scotch). We get absorbed in whatever we're reading, and if we are impressed, we'll often say, "Hey, can I read you something real quick?" This annoys both of us, yet we continue to bug each other. Last month, Johnny was convincing enough that Anne Rice's new book is making me "oooh" and "ah," too. I'm determined to persuade him to read Peace Like a River ASAP, but he keeps reminding me that he's reading a good book about Stonewall Jackson (by George Grant). I love Stonewall Jackson as much as the next guy, but please, tell my husband I'm right. I can't keep my mouth shut about Leif Enger's story much longer, and I gotta know Johnny's opinions! Anyway, I might share more thoughts when I'm done w/The Road to Cana, but if you're curious, go ahead and read both "Jesus books." They're absolutely beautiful. And if you're wondering, yes, I did read one of Anne Rice's vampire books: Vittorio the Vampire. It's not my preferred genre, but that book was great; it even had a quote by St. Augustine and a few redemptive elements. I liked the film Interview with a Vampire, too. So there. What are y'all reading now that Leif Enger is out of your life (or is he)? since i started reading your entries about Peace Like a River . . I ordered it on amazon yesterday. i get pretty lost pretty quickly in the world of literature (though i really do love to read)and have really enjoyed perusing your "good reads" list too. I saw Housekeeping on your list and remembered that a friend had recommended it to me awhile back. . your recommendation cinched it and as you read I am now reading it. I am almost done though so i hope Peace Like a River comes in soon. You'll have to tell me what you think of Housekeeping, and Peace Like a River, too! Have you read Gilead by Marilynne Robinson? I highly recommend it. I came this close to picking up Road to Cana at the library yeaterday before I saw your post. I didn't because I know that I don't have time to read it right now. My house is recovering from stomach bug (did I catch it from y'all over the Internet?) and we're going on a family vacation in just over a week. My mother in law is coming to visit shortly after that, which may afford me a little time for reading and perhaps I'll catch up with you then. I loved Out of Egypt, especially how richly she described the setting, so that you could really imagine Jesus in that time. And the portrayal of his relationship with his step-brother James. I'm sorry y'all caught the stomach bug again! I'm not going to start an entire theological discussion, but since you asked, no, I don't believe Mary was a perpetual virgin. I don't want to step on your toes because I know you're Catholic. But the Bible says Joseph "knew" Mary after Jesus was born (Matthew 1:24-25). So, that's my two cents. 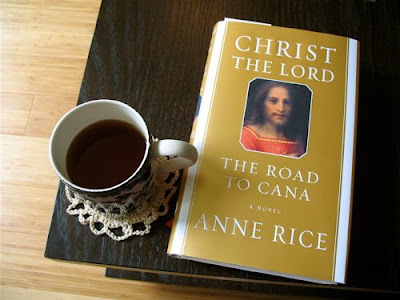 I guess I disagree with Anne Rice there, but there's so much else I love about the Christ the Lord books, and so much else that you and I agree on! Thanks for your charitable answer pointing to our agreement on other things and back to the merits of the book. I was just curious since you wrote about her accuracy how you felt about that point since I assumed that you did not agree with it. I'm glad that point did not diminish the rest. It's not the most in depth coverage of the issue, but it's thorough enough and briefly refers directly to the Scripture you mentioned. I guess I should have clarified better. I think Anne Rice's historical research is amazing. But since I'm Anglican, I can't agree with her Scripturally 100%. However, I do think she honors Scripture for the most part, in a beautiful way. I appreciate the link. I didn't read the entire article, but the part where it referenced Matt. 1:24-25 didn't convince me. Everywhere else in the Bible, when it mentions a man and woman "knowing" each other - it means the woman lost her virginity. I don't see why the language would change for Mary. And I don't think she needed to remain a virgin to be the servant of God that she was, and the mother of Jesus. That's all I will say because I know neither of us is trying to argue. We disagree on that point. Even so, Anne Rice is a wonderful writer. I'm so thankful she's a Christian. And, that you like her books, too. It's best to read my blog in Firefox. © 2008-2013 Jenni L. Simmons. All rights reserved.